In Cambridge, where I’m lucky enough to live, we are surrounded by beautiful and historic buildings, many of which are unique. If just one of them was threatened with demolition or was allowed to fall into disrepair, people would be up in arms. There would be protests, demonstrations and it would no doubt make the national news. Within the last ten years, we have lost four of our heritage crafts in the UK. These didn’t hit the headlines, yet these crafts are just as much a part of our rich heritage as our historical buildings. These extinct crafts include gold beating and sieve and riddle making. Only last month the Heritage Crafts Association was asked where British hand-made sieves could be bought, and the answer was, sadly, nowhere. Historic England has a listing system for historic buildings. The International Union for the Conservation of Nature has a red list for endangered species. But this is the first time that anyone has looked at traditional crafts in the UK and identified those most at risk. Generously funded by The Radcliffe Trust, the Radcliffe Red List of Endangered Crafts looks at every single heritage craft taking place in the UK today, focusing on those where there is a significant reliance on hand-work and with high levels of hand skill. We have looked at 169 crafts in total (although we’re bound to have missed some) and, after careful consideration, have assigned each craft to one of four categories: extinct, critically endangered, endangered and currently viable. Where we didn’t have enough information to make a classification, we put them into a data deficient category. Seventeen crafts have been identified as critically endangered – this means that they’re at serious risk of becoming extinct. These crafts have very few practitioners, generally spread across just one or two businesses, and usually with no trainees learning the skills. We sincerely hope that none of these seventeen join the four that have already gone. There is one skilled master vellum and parchment maker in the whole of the UK. There are two skilled clog makers (and there’s currently a revival in clog dancing), and four skilled horse collar makers. There are two businesses making coaches and wagons, one person making fans, and two businesses making hat blocks. There are three people marbling paper (indeed, we heard only heard about the third one last week), and only one piano manufacturer. And there are just a handful of trainees across these seventeen crafts! (All of this information is in your booklets). So, what are the problems and challenges? Well, they are, typically, many and varied, and often connected. For some crafts it’s an ageing workforce, a shortage of training opportunities or difficulties in recruiting trainees. For others it’s a fluctuating market, competition from overseas or the unwillingness of customers to pay that little bit more for handmade British items. Some crafts have problems with the supply of raw materials and tools (think of all the timber diseases we keep hearing about) and others point out that people just don’t know they still exist. For yet more it’s the myriad obstacles that have to be overcome if you are self-employed (which nearly 80% of craftspeople are) or running a microbusiness. Sadly there isn’t a magic bullet cure-all solution, but the research has highlighted how precarious the future of all heritage crafts are when they are in the hands of only a few skilled craftspeople. So, now that we have identified the most critically endangered crafts, and understand more about the challenges they, along with all crafts, are facing, what next? 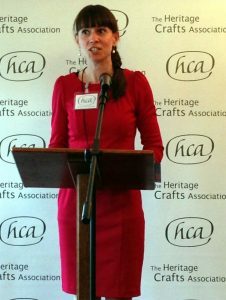 We feel it’s crucial for the government to clarify the role of the Department for Culture, Media and Sport in supporting heritage crafts, as they do for contemporary crafts, and to make the necessary changes. For too long we have been bounced between heritage – which means historic buildings and museums – and arts – things that you can put on a shelf and admire. In 2003 UNESCO produced a Convention on the Safeguarding of Intangible Cultural Heritage. This focuses not on the physical things like buildings, monuments, and artefacts, but on the non-physical aspects of our heritage like traditional performing arts, festivals, and, importantly for us, craft skills. The UK is one of only 22 countries out of 194 that haven’t ratified the convention, the government saying only that ‘it isn’t their priority’. We would like to be pro-active in ensuring those seventeen critically endangered crafts don’t become extinct, and also in preventing any other crafts from entering that category. For that, the broader issues of the heritage crafts sector need to be addressed, particularly relating to training, recruitment, and market issues. And that requires proper funding and support. Finally, this is a significant piece of research which should not be shelved and forgotten. Like Historic England’s listed buildings register, or the red list of endangered species, The Radcliffe Red List of Endangered Crafts needs to be regularly monitored and a thorough (and funded) review conducted every 3–5 years. We are incredibly grateful to everyone who has supplied information about the crafts, and cannot thank the Radcliffe Trust enough for funding this research, which has enabled us to shine a light on this important part of our shared cultural fabric. We sincerely hope that the Red List will serve as a starting point to encourage future interest and research into heritage crafts, and to ensure that these rich and diverse craft skills carry on into the future.